The 2000 growing season got off to a normal start, followed by a heat wave early in the season which may have moderated the crop level. The summer was a bit warmer than the two preceding vintages, much to the relief of winemakers and growers. 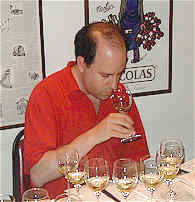 The harvest for Chardonnay was not abnormal, so winemakers had no unusual challenges in vinifying their wines. 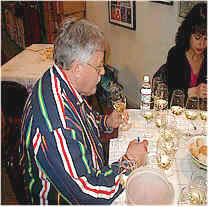 Our tasting featured a number of top names in the world of California Chardonnay. The overall quality level is quite high and we were able to see just how much influence the winemaker has over these wines. In our previous tasting of Condrieu wines, winemakers try to capture the fruity elements of the Viognier grape. 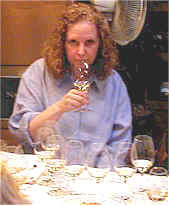 With Chardonnay, it seems winemakers strive for lees contact (contributing a toasty note to the wine as a result of the wine's contact with the spent yeast following fermentation), strong oak influences on the nose and palate, a secondary fermentation (contributing a buttery quality to the wine) as well as featuring an alcohol level as high as a mixed drink. "This burned my mouth!" said one critic about the group's last place wine. Another taster described this as "Lactic and oaky. The real problem," he said, "is there's no fruit here. It's leesy and could be ANY oaky white wine. It's bitter, too." Others agreed with the wine being lacking in the fruit department. Someone else felt it had been a "heavily charred barrel and this covers what meager fruit there is." I described the wine as showing hints of hay and bread dough. There's a mildly yeasty note here, but the nose is not nearly as enticing as others in this field. The wine, like most in this tasting, shows some hotness from the alcohol. There's a light appley fruit quality on the palate and some toasty oak. I'd give it about a one-half star rating (3 stars maximum, zero being a standard or average quality wine). "This has a sweet, floral nose with some orange rind flavors on the palate." said the lead-off batter. Another person described it as having "woodsy, outdoorsy aromas." One woman found this to be "everything over the top! It has too much of everything!" Another individual found it to be "coarse and it has a curious mouth-feel." Someone else said "it's a bit soft and warm, with but modest depth of flavors." Another person criticized it for being "closed-in at first with a bit of SO2 at the start." I found rather pretty appley fruit with some mildly oaky notes on the nose. There's a hint of a dusty and toasty character as well. I felt it showed more brightness on the palate, with some appley fruit flavors and a nice bit of oak. There's a slight burn from the alcohol here. One star. "This wine had my favorite nose of the bunch, but it fell apart on the palate leaving me disappointed." said one critic. 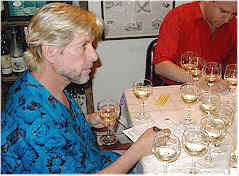 Another person characterized the wine as having a strong "lemon" quality. Another taster found it to have "lots of acidity but it's one dimensional." Someone else said "It has a terrific nose, but not enough on the palate." One woman found "odd aromas which reminded me of a mix of guavas and toasted marshmallows." I thought the nose was quite good, displaying vanilla bean fragrances and some leesy, toasty notes. I was less enthralled by the impression of sharpness from the alcohol and, perhaps, a touch of wood tannin. The flavors are okay, but the strength of the wine, for me, was its undoing. One star+. "Over ripe and liquid honey!" 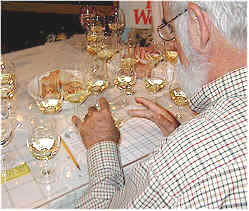 are the descriptors employed by one tasting panel participant. Another fellow said "I'd like to ask the winemaker if this is what he intended to make," finding the wine to be oxidized. Someone else described this as showing "peachy oak and apples but with a sour pickle barrel note." Another taster found a fair bit of "botrytis, pineapples and raisins." One taster found notes of "ginger ale, oaky and nice complexity. It's a bit sweet, too, but nicely intense." Another person found this to have a "tart finish with notes of grass and a strange 'fish & chips' character." One woman described this as "fresh and approachable," which we presumed to be her view of the wine and not the winemaker. My view was of a spicy, almost floral wine which has notes of honey and wood spice on the nose. It is slightly sweet, which dropped this in my estimation. The flavors are of sweet fruit and honey, reminding me more of a Riesling which has some toasty oak and vanillin notes. One-half star rating. "Pineapple, dusty, smoky notes with a hint of sour cabbage. It has nice, sweet oak and a melon-like flavor. It's honeyed, a bit oily, flabby, astringent and disjointed." said one woman. Another taster found it to be "flat and one-dimensional." A third person found a note of SO2 on the nose. Someone else found "nice, toasty oak, not a full malolactic...crisp with a hint of grassiness yet it's recognizable as Chardonnay." Another person found it to be "complex, tasting a lot of caramel and honey, but not over the top!" "This has a toasty nose, not much fruit and it a bit dumb. There's a citric quality, toasty and it's rather deep on the palate with better flavors than I expected based on the fragrance." said the first critic. Someone else felt this can "age a bit. It became more appealing as it sat in the glass, showing bright, lemony fruit and some butterscotch flavors." A third taster summed it up, saying "It's a really nice example of 'buttery' California Chardonnay." I described this as having an appley fruit character, complemented by a cinnamon spice note. The apple fruit is evident on the palate, too. Very nice. One star. "Wonderfully ripe, lemony aromas in this aromatic Chardonnay...it's crisp yet has a silky texture with key lime pie notes. Thoroughly delicious!" said the lead-off batter. Another taster felt the wine "was beyond 'crisp.' It was shrill!" Someone else said it was "well-balanced and full-bodied." Another taster found it to be "a bit earthy, but then it exploded with flavor and a very long finish." Someone else said it's "got a lot of toasty oak, nice depth and concentration. And it's a bit lactic." I found this to be quite distinctive. I suppose the extreme spice notes emanate from the particular barrels used by Pahlmeyer. Aside from the normal toasty notes, this displays a clove or nutmeg spice quality. The wood also gives a bit of 'bite' to the palate, the wine showing plenty of oak. One star +. "This wine is a butterball! I really liked it and it's unique." said our first critic. Someone else felt this was "overcome with leesy notes and bitterness. It's lactic, oaky and bitter." Someone else felt this was "hot and short and low in acidity." Another felt is was "hard to find the fruit here." One person said this was "big everything! It's big in every department." Someone else criticized it for "having no fruit." I really liked the smoky overtones here. The wine is quite toasty and it does rely on its styling more than the grape. You can really see the winemaker's fingerprints on this wine. I liked the flavors for echoing the toasty, smoky theme and for not being as "hot" or sharp as some other wine. The wine, clearly, is made with a tip of the cap to Burgundy. Two stars.